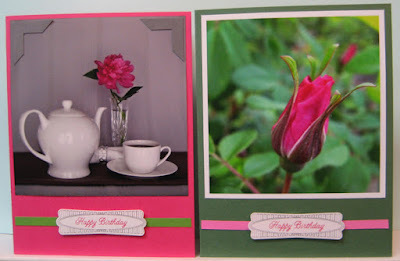 I was in need of a set of cards as a gift and decided to see if I could create a set from used calendars pages I have received from my sister, Sylvia over the last few years. I chose two tea images, a close up of a rose bud and this cool one that maybe ice on a window. 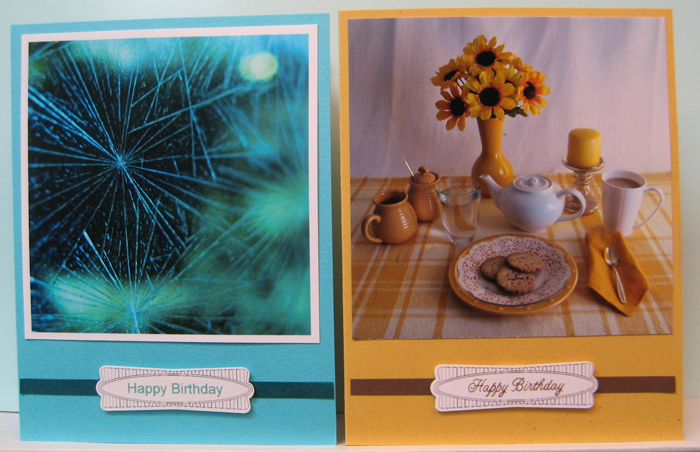 I trimmed the images to 4" x 4" and created coordinating greetings using a digital frame for the Modern Label punch (SU). I simply added a greeting in a coordinating colour in the oval in the frame, laser printed them and punched them out. I adhered the images to the top of a coordinating card, added a strip that coordinated and mounted the punched greeting over the strip using 3D foam tape. I am very happy with the way they turned out and gives me another layout for using these calendar images. I made this set of cards with these images a while back. These images are so beautiful I am happy to be able to give them a second life! !